A breeder stopped in for some advice on her dam that was running a temperature after four days and a hard whelp. I sent her to the vet, and she went on antibiotics. While here she wanted to show me how she did the dewclaws on her new litter of puppies, and see if she did them correctly. UH-OH, she did not. This new breeder did not remove the dewclaws; instead she took off part of the rear pad of the foot which is called the carpal pad. It is found on the forelimb, and is used for additional traction when stopping or descending a slope. 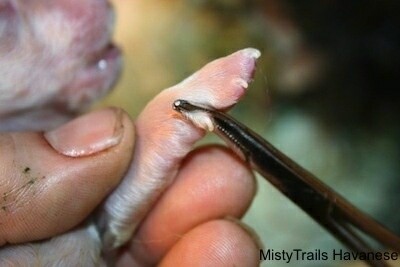 This picture shows the pointer pointing to the dewclaw. The breeder actually removed part of the pad instead of the dewclaw. Pointer pointing at the pad, part of which was taken off by mistake. I called our vet to see what the long-term problems will be; hopefully they will be minimal. Since she did not remove the full carpal pad, it may grow back. Luckily there is no bone in it; it is just cartilage. The puppy’s pad, part of which was taken off by mistake. Pointer pointing at the dewclaw. 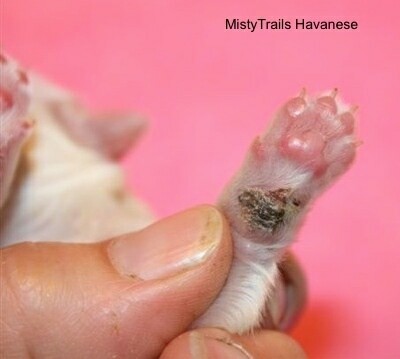 The pad is below the dewclaw on the bottom of the foot. Pointer pointing at the actual dewclaw. Pointer pointing at the pad. DO NOT play vet and do your own vet work if you are not sure and confident of what you are doing. Dewclaws can be removed on most breeds but not all of them. Some breeds need them. 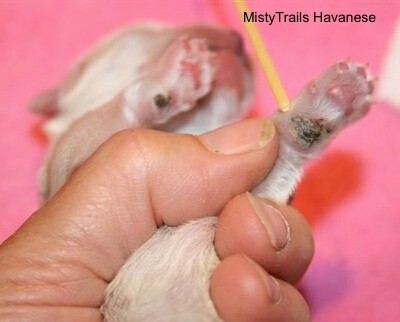 Most puppy clients wish to have the dewclaws removed at birth. 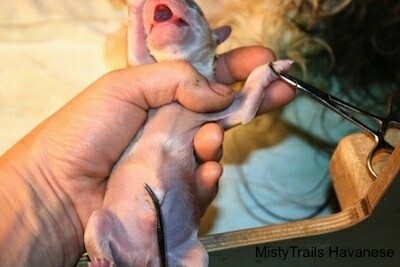 Pictured is a puppy getting its dewclaws removed correctly. It was done within 5 minutes after birth. It makes them scream which clear the lungs. They do not bleed as they have the clotting factor. The dam allowed me to do this right in front of her.